Earlier this week we noted that according to Charlie McElligott's quant model, we were just days away from a critical CTA "sell trigger", which as we followed up was triggered in the Russell 2000 the very next day, sending small caps sharply lower. It now appears that after being marginal buyers for the past month, CTAs selling has spread to the broader market as well. Having failed for the past 3 weeks to break decisively above the "quad top" level of 2,800, the S&P has since declined significantly, losing much of its upward "goldilocks rally" momentum. Nomura believes the current correction in the US stock market is due to either: 1) Technical-based trend followers rapidly cutting their “loss-making” long positions on major US equity futures market, or 2) Some major positive factors that have supported financial market conditions on the fundamentals side, eg hopes of a US-China trade agreement and major central banks’ dovish shift have continued, and because some medium and long-term investors are looking for opportunities to buy-on-dips in the US equity market. Looking at the market, Nomura's "other" quant team, headed by Masanari Takada, believes the former factor is dominating trends, in other words CTAs have started selling. Elaborating on that point, Takada writes that the S&P500 has finally breached the "trigger level" of the CTA's cost breakeven ~2,750 level such that CTAs are liquidating their existing long positions, accelerating stock selling and cutting their “loss-making” positions. CTAs have behaved similarly on the NASDAQ-100 futures market as the NASDAQ-composite index has slipped below the ~7,460 level, which was the CTAs’ breakeven cost. What happens next? Confirming what McElligott said previously, Takada says that going forward, systematic trend-followers will be forced to clear most of their long positions, so mechanical stock-selling pressure is likely to increase. However, and as McElligott also noted yesterday, as the current pace of CTAs unwinding their long positions is faster than past average patterns, this is likely to encourage some other “contrarian” type fast-money to buy in the falling market, as such systematic selling pressure generally softens around late March. For now, however, investors that have maintained a bullish stance on US and global equity markets based on fundamentals, are likely to have a reality-check as a result of "cooling" equity market sentiment. During this period, Nomura warns that "there is a risk that Street expectations will become more pessimistic as a backlash from the risk market rally of the past two months." 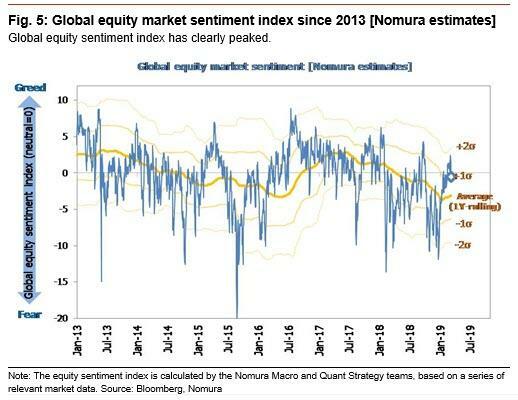 Meanwhile, even as CTAs start selling, the most concerning development for equity bulls according to Nomura is that global equity sentiment has fallen into negative territory again. The current market adjustment is also considered a “cooling-down period” from its elated period, so it has desirable aspects too. However, if more negative factors and headlines such as US-China trade talks break down, the yield curve inverts further, and there is an increasing likelihood of President Trump being impeached, investors will be less willing to take on equity market risk. In fact, global macro HFs focusing more on fundamentals seem to have strengthened their cautious stances while accumulating short positions on US equities and long positions on long-term UST bonds for now.